Antonio Pineda [b.1919] is one of the most influential and prominent Taxco Modernist Jewelry Designers & Silversmiths of the 20th C. He began his career while still in his mid-teens and apprenticed under renowned masters of the period while still honing his immense innate talent. After several years of working for William Spratling, he branched out on his own by forming his own jewelry studio in 1941 and as his business and reputation expanded rapidly, opened a second workshop & retailer’s operation in 1956. He never ceased to experiment with new techniques or try different innovative designs and his work was often exhibited alongside other greats of his time, incl. Margaret de Patta and Georg Jensen. 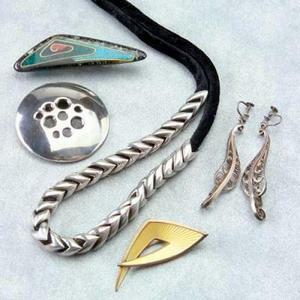 In addition to selling through his own Tallers, his masterpieces were also sold through fine retailers abroad as he quickly became a sought-after artisan and creator of high quality silver jewelry. He marked his pieces with a variety of logos or trademarks, all of which are included in our Silver & Jewelry makers’ marks guides. In addition to the several documented marks that help in dating his work, Antonio Pineda also used some characters to denote a certain category of jewelry, for example - and according to a recent interview with Patrick Kapty - he used the letters YY for Silver Jewelry Pins and ZZ for Bracelets, Rings etc, but not always. Certain special designs were also marked with extra characters. His elegant silver jewelry and fashion accessories have always been prized by collectors, fetching high prices at auction the world over. Below are some examples from our Pricing Guides. Demand for Antonio Pineda’s pieces is still very strong and expected to continue for a long time. Collecting Pineda jewelry is a good investment as their worth keeps increasing for the foreseeable future beyond its precious metals content. His designs are most often unique and priceless, inspired by true Mexican historical and folklore influences, yet with a distinct Modernist twist. Here is an article on an overview & evolution of Modernist Jewelry with interesting historical notes and perspective.